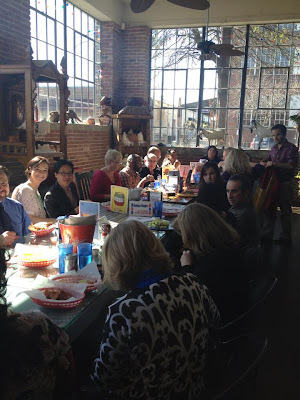 We had a fantastic meet-up today at Cantina, with around thirty-five people in attendance! Due to the high turnout, it was impossible for me to get a complete listing of everyone, so I'm posting a link-up below. If you were at the meet-up today, feel free to link your blog, Twitter, and/or Facebook account so that we can all connect. Also - if you haven't connected on the Alabama Bloggers Facebook page, please take a second to join the group here! It's a great place for discussions, questions, sharing posts, and discussing local blogging information. Thanks to Wade for being our host, Cantina for the great food, and to all of you for coming out! Had a great time meeting lots of people at the meet-up. Looking forward to checking out everyone's blog. Another great event, thanks Rachel and Wade! Wish I could have been at the meet-up! Please use our info - emails - that we used to register on Wade's site to notify us! Also, how about hosting meet-ups in different parts of the state sometime? South Alabama bloggers would love a chance to meet! Thoroughly enjoyed the meetup; just wrote a quick post on what I learned.